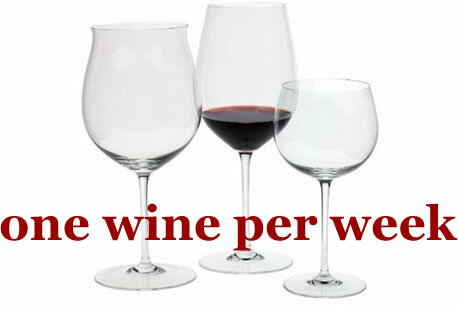 One Wine Per Week: The 16th Bottle?? If you've been following this blog you know that my means of wine storage originally started out with an Emerson 8-bottle capacity wine cooler. After considering some possible logistical problems and being unable to resist a sale, I added a 2nd unit of the same kind, doubling my storage capacity. Well, it's been fun shopping around for stuff to fill up my two boxes. The bottles currently residing within the 57-degree confines were picked up after browsing Costco, the L.A. Wine Company, and Trader Joe's. And now the net, after adding the purchases and subtracting the consumed, is 15 bottles. Yes, there's ONE more slot to be filled. Given the limitation of only 16 bottles, I've tried to select pretty carefully what goes into the collection and I think I've assembled a fairly interesting group. Given also my one-per-week consumption, that makes for a pretty slow turnover. I can imagine if I had more storage capacity I'd be out there buying things left and right but soon I'd be faced with the problem of, when am I ever going to get around to drinking all this stuff?? Forcing myself to stay at no more than 16 takes care of that potential dilemma! And I tell you, no cheating and storing extra bottles around the house sans a temp-controlled environment because today when I got home from work it was 85 degrees indoors before I ran to turn on the air conditioning. Yet those two little Emersons were diligently maintaining a 57 degree interior so I have to hand it to them, they're doing their jobs. Anyway... my dilemma is that there's just ONE open slot to fill. Up until this time if I ran across a couple or more interesting-looking and affordable bottles, I'd snap 'em all up. But not now.. if I run across more than one tempting selection, my circuits will overload. What if there's two or more good ones at the store? Will the extras still be there next week? Meanwhile they will have been sitting under the fluorescent lamps all this time with less than ideal temperatures! Haha, I just have to tell myself look, one might be gone but another will take its place. And as far as the lights and temperature, what do you think they were going through before I bought them? Am I going to stand outside the warehouse waiting for the truck to roll up so I can buy them before they've had a chance to deteriorate in the store? Get a grip on yourself!! Well of course I'm going overboard on this but truly I do need to choose that last one carefully! And then the process repeats itself the next week, and the next, and so on and so forth. But it's fun. I'll tell you what #16 is when I find it and put it in its new home.